My discipleship group is studying through the book of Romans. We had a great meeting this morning as each guy taught us a lesson or devotion from a different passage in chapters 4-5. One of the guys, Justin Snell, even had props (I.e. water bottles and food coloring) to help teach/explain Romans 5:15-21. Wayne Shelnutt is the life of the party and always keeps us laughing. He said, “I’m teaching on Romans 5:3-5 because those are really the only verses that I understood what Mr. Roman was talking about.” He said it was a Janet Jackson quote. Anyway, all the guys did great teaching their “mini-sermon”. I shared with the guys this morning the S.P.E.C.K. 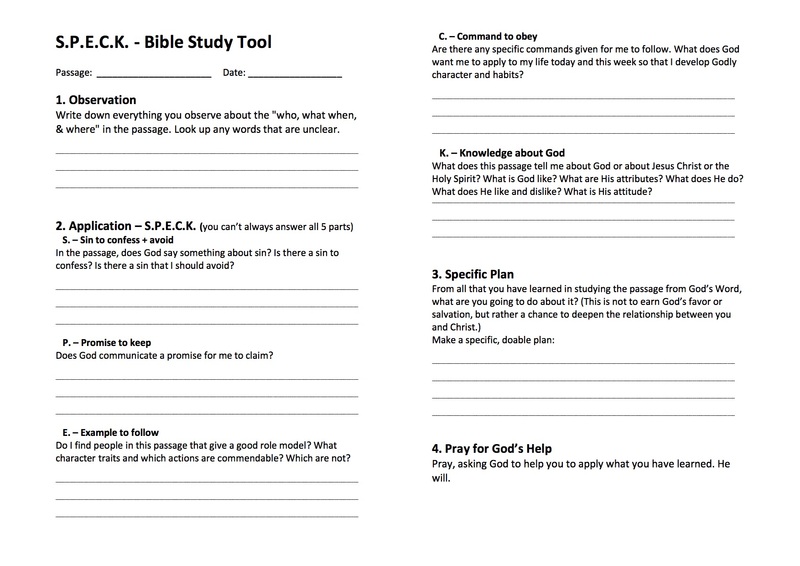 Bible Study method. It is 5 questions to ask when studying a passage of Scripture. I thought I would pass it on to you. I hope you find it helpful.